Wanted by Chris Goode and Company, as part of Transform ’16 in Leeds. Tales of struggle and survival. These are some of the answers Chris Goode & Company got when they asked the people of Leeds: what do you most want to see on stage? The result is Wanted, which aims to give them what they want. As part of Transform ’16, the show realises 24 different ‘wants’ in three minute segments, performed by professional actors and members of the community. You might think what people want is pretty well catered for by commercial theatre. Wanted, being a Chris Goode show, is obviously not Les Mis. It is more idealist than populist, arguably less about how theatre as an artform should be and more about how we as a society should be. But theatre can be a useful, utopian rehearsal space for figuring these things out. Wanted considers who is given a voice, who is represented on stage, and how. It’s about putting the power to make that decision directly into the hands of the audience. And its audience-participants are not a cross-section of your average theatre-goers. 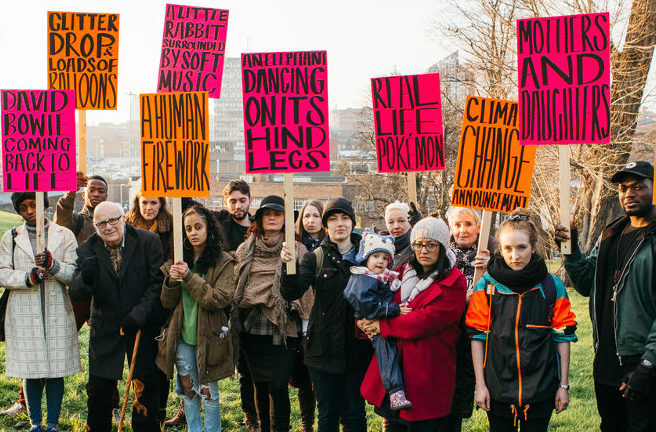 Represented in Wanted are several community organisations, many of whom use their three minutes as dramatic mini-campaigns – grabbing with both hands the chance to stage stories of those often sidelined by society. Leeds Mencap’s section features pre-recorded voices of young people with learning difficulties appealing for greater understanding; performers move from anonymous silhouettes to boldly facing the audience. It’s simple, but the honesty proves deeply moving. Other sections give voice to a range of LGBTQ experiences, wittily smashing stereotypes. Monologues are staged about breaking cycles of oppression against women, whilst others offer spoken word stories of immigrant experiences. Video, movement and music are utilised, with the company finding theatrical means to give life to concepts or conceits. A homelessness charity’s potent story of exclusion, for example, is silently realised through being acted out only with shoes. There’s a lot of cheerleading for equality, love, kindness, patience, and peace. Is this sometimes naïve, over-earnest, indulgent? Yes, Wanted often is naïve, over-earnest and indulgent. But when you’ve seen 30-odd primary school children shout about how war is wrong before breaking into a superhero dance party, cynicism is impossible. And, suddenly, quite undesirable. Wanted makes you think about how you want to look at the world, as well as how you want the world to look. Away from the right-on stuff, there are more esoteric, uplifting offerings: a man sings David Bowie’s Heroes, a toddler is swung wildly in circles, small children perform in Yorkshire dialect, and a rabbit sits in a pen while Bright Eyes plays. Besides, there can be no telling participants that what they want is wrong, even if it seems like self-promotion or special pleading or just a bit naff. As a result, Wanted can be patchy, but the format helps make that ok. At three-minutes a pop, if you don’t like this skit or that bit of sermonising, something completely different will soon be along. And, on a practical note, it is great to see a truly diverse cross-section of society on stage: differently abled, all ages, and with a range of ethnicity, gender, sexual orientation and class. Goode’s work often involves the voices of ordinary people, and Wanted is about listening to and working with a community (community here being both ‘the audience’ and ‘the people of Leeds’). Such participatory practice is often as much about the process as the product, which can be tricky for the reviewer. It’s not uncommon to feel that, however valuable a show has been for those taking part, the end result is less rewarding for those watching. A better journey than destination. This is not the case with Wanted, as process and product are twined like a string of DNA. The product works because of the process, because you too feel the hope and joy and bravery that has gone into the show. It comes from an audience and carries back out to the audience too – rarely have I been in an auditorium that feels so invested in the work onstage. There’s a concentrated intention behind each segment. Every three minutes are made to really count, to really say something. And when such intentionality is buoyed and bolstered by huge amounts of love in the room, it knits together to produce something wonderful. I repeatedly found myself using my sleeve as a hanky, and it was the hope and joy and bravery – and, ok, the adorable children – that slayed me. If I saw a fictional show that featured kids singing about peace while balloons rained down, I’d cry ‘emotional manipulation’, not tears. It’s hard to write about this without sounding sentimental myself, but Wanted so clearly comes from the heart that it genuinely melts you, over and over again. Wanted was staged as part of Transform ’16. Click here for more information.